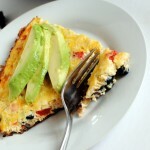 This Frittata is packed with vegetables, delicious and quite filling! Whisk eggs together in a large bowl. Add black beans through garlic salt. In a large skillet, heat butter (or olive oil) on low to medium heat. Pour in egg mixture. Reduce heat to low and cover with a lid until the top of the frittata fully sets. Slice immediately and serve with desired toppings. Enjoy!